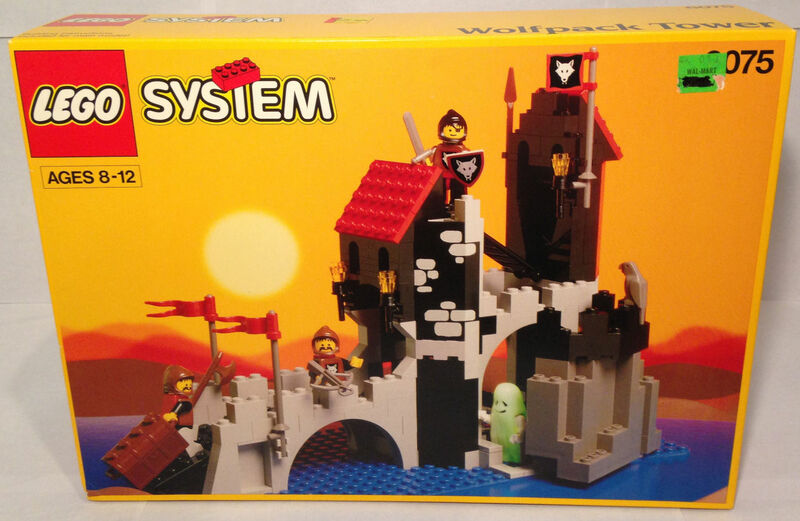 1991 was a lackluster year for the LEGO Castle theme with the release of only one new set. It was a small catapult only available in a multi-pack and hardly noteworthy. Thankfully castle enthusiasts received eight new sets in 1992 and a brand new faction as well; the Wolfpack Renegades. The Wolfpack were primed to take the mantle of outlaws from the Forestmen, whom were being phased out by 1992. Typically they would be included as prisoners, intruders, or general interlopers in larger sets from other factions. Sadly the Wolfpack wasn’t nearly as prolific as the aforementioned Forestmen. Throughout their entire run the Wolfpack only received three featured sets, the largest of them being #6075 Wolfpack Tower. This is one of those sets I never owned as a kid but had on my wanted list. Unfortunately when I had the spare cash saved up this set was never quite high enough on my list of priorities to make the purchase nor was it ever received as a gift. I would call this set a “tweener”. It was too expensive to pick up as an impulse buy but not large enough that you wanted it to be your big birthday or Christmas present. It was the type of set that you could potentially receive as a gift from a family member that loved you enough to buy you something larger than a small set, but not enough to warrant a major purchase. Since my family was pretty limited in scope the cards just never fell into place and eventually the Wolfpack Tower would be taken out of circulation before I could acquire one. 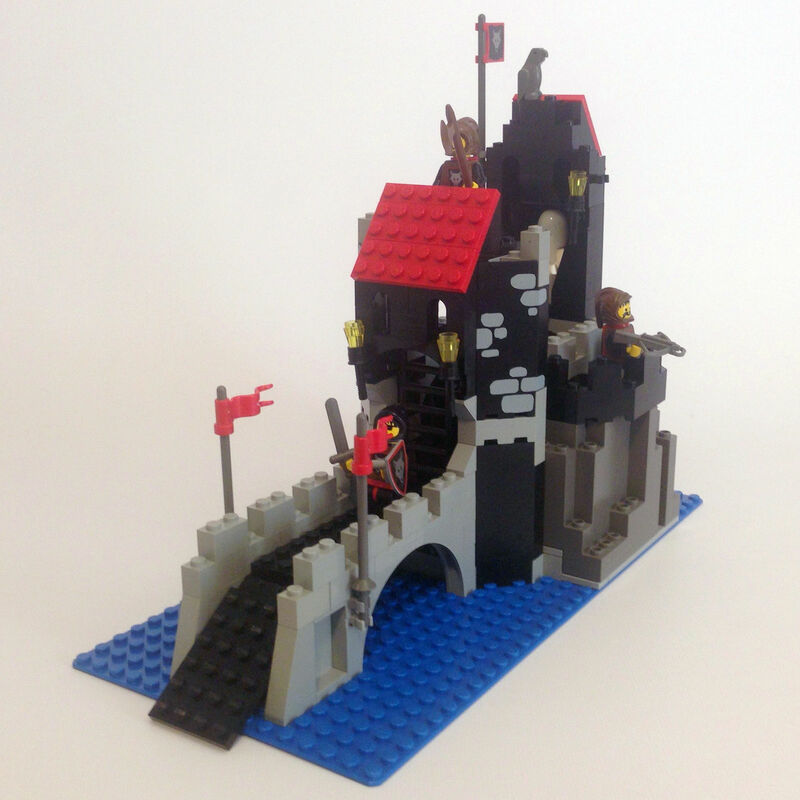 Although I never bought the Wolfpack Tower I did have experience with it through childhood. 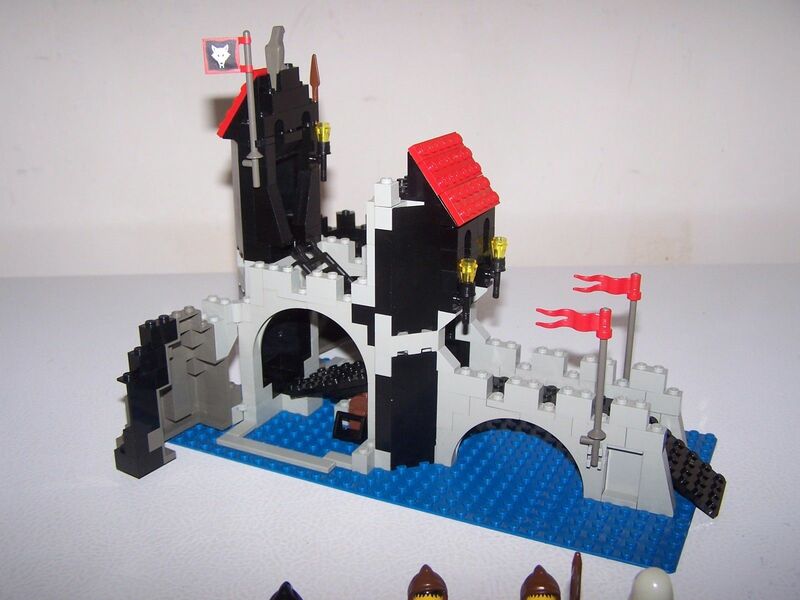 Aside from examining it in the catalogs and posters, an odiferous friend of mine that was also a LEGO enthusiast owned this set and we would frequently play with it during our castle adventures. One of the great things about visiting his house was that he owned several different sets than me. Through him I was able to experience a broader scope of the LEGO spectrum than I would otherwise have. His cool toys made enduring his pungent aroma worth it. This set does an excellent job of creating a foreboding atmosphere. The drab black and grey with a splash of red built upon a blue water baseplate are the perfect mix. I always envisioned this structure as an old crumbling barracks which had been long abandoned by it’s builders and left forgotten in a lake for generations. Eventually the Wolfpack found it and inhabited it as their criminal activities necessitated a remote hideout. The bridge leads to a dark and hollow looking entry way kept shut only by a ladder piece which acts as a portcullis (this is because the doors had been rotted away over the years). Once inside a ramp leads downwards to a water logged basement. Obviously this is an old leaky complex that hasn’t received proper upkeep. Climb up the ladders towards a lonely looking tower which, despite illumination with a torch is still dim and houses a friendly spirit. Since the building no longer holds any strategic importance and has been abandoned for centuries its location is unknown by the local government and thusly became the perfect refuge for our outlaws. 6075 was the first appearance of the big rock pieces which are on hinges and allow access to the lower levels. Guarding the old fort are three ragged looking Wolfpack outlaws and the ubiquitous glow in the dark ghost. Of course no castle set would be complete without the necessary treasure chest and an arsenal of weapons and shields. Surprisingly absent in a set of this size are any of the standard castle wall pieces, although there are eight of the castle corner pieces and a rounded battlement. Although this is a great set it does have it’s drawbacks. The bridge and entrance look great, but once you move past the entrance there really isn’t an interior. Unless your Wolfpack guys like to hang out in a flooded basement, the first floor only consists of a small ramp that is 4 studs wide and leads to nothing. The rear tower is only big enough to fit one minifig (standing) and the front tower doesn’t have any space at all. I’ve always felt there should have at least been a small plate behind the front gatehouse, but then the ladder piece that acts as a portcullis would be incapable of raising up presenting a different issue. The real problem with this set is the scale. If you remove the figures it looks like a cool abandoned fort, but when you add the figures it becomes very clear that they are simply too large for the building. Fortunately LEGO is all about customization so any of these complications can be rectified. Many years after I was supposed to have outgrown toys I began buying up old sets I missed out on as a kid. Wolfpack Tower was one of those sets I was very happy to add to my collection of 90’s toys. There’s just something so gratifying about finally acquiring these Lego sets that eluded me for so many years. In fact, in some ways I have more fun building and playing with the sets I didn’t own than the sets that I had and played with throughout my youth. It’s as if I’m completing a several decade journey and making my 10 year old dream’s come true. Acquiring Wolfpack Tower made a small dream of mine come true, and at the end of the day this set was worth the wait. I didn’t have any of the bigger castle pieces, but this I owned. I loved it! The guy with the hood and eye patch had that Raiders mascot look going on, and then there’s the ghost, who I believe guarded a treasure chest (at least it did when I played).